This workshop is for any photographer who wants to create and photograph truly genuine expressions; who’s primary subjects are people and who’s wish is to get inside their subjects’ heads and entice them to feel and react to things in a way that feels natural, in a way that’s prescribed, directed and controlled by you. This class is limited to twelve participants, includes lunch with local beers. 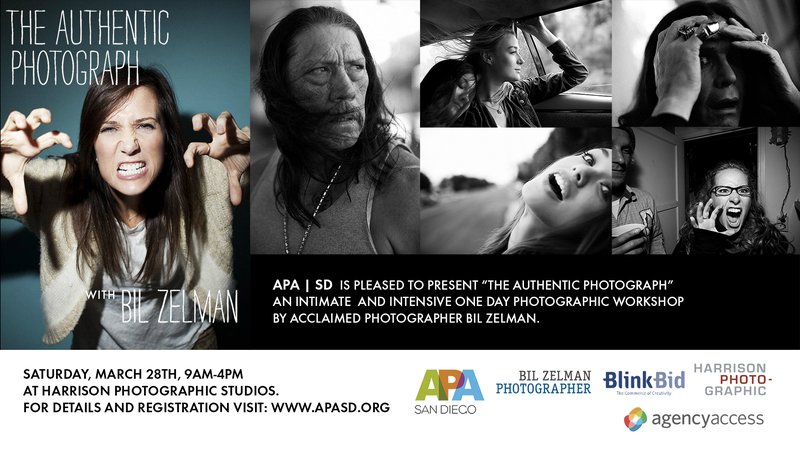 100% of the proceeds go to the San Diego chapter of American Photographic Artists. Through casual and entertaining roundtable style discussions, demonstrations, shoots and visual case studies, Zelman will walk you through a variety of shoot situations and send you home inspired and with fresh new thoughts on how to approach your subjects and your work. This is an intensive group class and together you will cover a ton of ground. Cameras, notepads and/or voice recorders are highly recommended! RESERVE YOUR SPOT TODAY HERE! Over the years Bil Zelman’s campaigns and editorial work has required his images to convey very specific expressions – satisfied vs. happy, pride, elation, celebration, rivalry, defeat, consolation, intelligence, being “lost”, absorbed, pensive and a slew of others. Figuring out ways to make those people genuinely FEEL those emotions vs. acting them out is the secret to creating powerful, lasting imagery. Zelman’s been attacked by a neck-biting monkey while snapping shots of sloths in the Amazon, floated on icebergs in Patagonia, sailed through the Bahamas with Alexandra Cousteau and shot in over 30 countries. He’s partied with Gaga; cracked up the “it” girl of comedy, Kristen Wiig, getting her to squawk like a bird for a portrait; and shot David Bowie as his first megastar assignment at the ripe age of 20. Since then, Taylor Swift, the Rolling Stones, Ozzy Osbourne, Tony Hawk, Jerry Seinfeld, and myriad other A-listers have all posed for him. Consistently touted as a Top 200 photographer worldwide by Lürzer Archive, Zelman has shot and directed dozens of international advertising campaigns for brands such as CocaCola, Jim Beam, Harley Davidson, Bud Light, Guinness and Apple. His work has been shown or collected by The Museum of Photographic Arts, The Museum of Contemporary Art, The Lucie Foundation, FCMOA, The Center for Photographic Arts, The Center for Fine Art Photography, The Center for Exploratory and Perceptual Arts,Newspace Center for Photography, The Portland Museum of Art and many others. His most recent book Isolated Gesture was awarded an Art Director’s Club award by Albert Watson.